What about that baby in Carrie Cracknell’s Young Vic production of A Doll’s House at BAM? You don’t see too many live babies on stage these days and this one was remarkably well behaved. 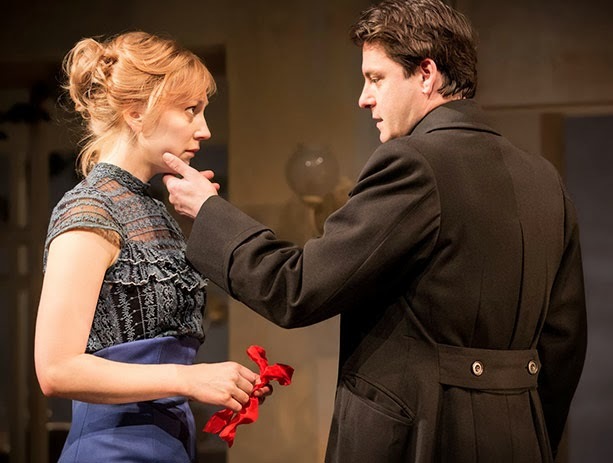 However besides the baby, the production has much to commend it including Hattie Morahan in what can only be defined as a phenomenological interpretation of the character of Nora, to the extent that it doesn’t address her femininity or lack thereof, but the confines of her being. Actually the current production centers around both Morahan’s Nora and the family friend, Dr. Rank (Steve Toussaint). There are three key scenes in this regard. In the first Nora reveals her big secret to an old childhood crony, Kristine (Caroline Martin), a widow left with “not even grief for a sense of loss to nurture." For the sake of present happiness Nora's mortgaged her future. In plain terms she’s signed a fraudulent loan to accommodate a yearlong trip to Italy. Whether she's making a sacrifice for Torvald (Dominic Rowan) who has been ill or merely using his illness as an excuse is ambiguous. Supposedly it’s her husband who treats her like a child addressing her as his “hamster,” his “skylark,” his “humming bird,” his “most treasured possession,” but her actions are plainly impulsive and childish and a reflection of her own ability to quell her appetites. Ingmar Bergman’s production of A Doll’s House, which played at BAM a number of years ago emphasized the notion of self-realization. The Bergman Nora could have been a man as well as a woman. But the brilliance of this Nora is the way it’s influenced by Hedda Gabler, introducing the death instinct in its exploration of the feminine mystique. The two scenes exploring Rank’s being both occur with Nora. In the first he talks about life as fulfilling the need “to continue feeling tormented.” In the second he unveils another layer of the onion. He’s consumed with love and is critically ill. While Nora is lying, Rank is dying. These two leitmotifs say more about the play then the famous denouement when Nora walks out--which considering the modernity of the interpretations provided seems almost anticlimactic. Yes, Torvald’s narcissism and selfishness are revealed. Nora is just a piece of the puzzle. But so what? Is Nora any less directorial and narcissistic in her machinations. The revelation is almost Newtonian in a production that’s well situated in the world of relativity. The rotating set is like an old vinyl record revolving on a turntable and the feeling it creates is one of synchronicity. Rather than a succession of epiphanic moments, the varying scenes unfold complete and complex lives. The circularity is mirrored in Morahan’s rendition of the play’s famed tarantella which foreshadows her so-called liberation. The current A Doll’s House, with its emphasis on subjectivity and intention, is a brilliant and out of the box approach to the Ibsen classic.